Hart’s Desire Miniatures is run by the dynamic mother-daughter team of Marge Hart and Gail Domiano. Gail says, “My family has been involved in miniatures since I was a child. I won a dollhouse in a drawing and my mother made all the furniture for it.” From that point on, they were hooked. In 1977, Marge opened a dollhouse shop called “Miniature World” in Bloomington, MN, and Gail worked there building houses and doing demonstrations. Eventually, Marge sold the shop and focused on selling her own creations at miniatures shows. She came up with the name “Hart's Desire Miniatures” from her last name (Hart) and the fact that she made whatever she desired! Over the years, things have evolved and Marge continues to work with fabric and specialty items, while Gail focuses on working with wood and paper. She realized she was more interested in making structures than accessories. 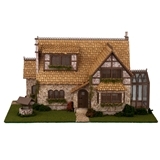 Several years ago, Gail purchased her own laser cutter and has been focusing on designing, producing and distributing 1/48 and 1/144 scale houses and furniture kits. 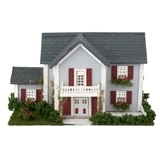 She says that her house kits are unique because they include everything a customer needs to complete the structure, such as pre-cut siding, windows, doors, shingles, wallpaper, trim and even landscaping items. 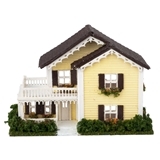 All of the house and furniture kits are authentic replicas of full-scale houses and furniture, and Gail includes step-by-step instructions and helpful tips with all the kits. 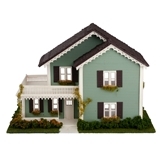 She has even made a tutorial video for her 1/48 Scale Victorian House kit, #5323. Much of the information included in this video can be applied to other Hart’s Desire kits. 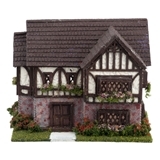 As part of our commitment to supporting and promoting high-quality handcrafted miniatures, Hobby Builders Supply/miniatures.com is happy to offer many items from Hart’s Desire Miniatures!